Thank you for choosing Telerik RadSpreadsheet! RadSpreadsheet is a control that allows editing tabular data utilizing a variety of cell formatting options, styles and themes. RadSpreadsheet operates with a rich document model that is completely decoupled from UI. The documentation of the model can be found in the RadSpreadProcessing section of the documentation for Telerik Document Processing here. use cell styles and themes for a more consistent look. A broad range of formulas in different categories. 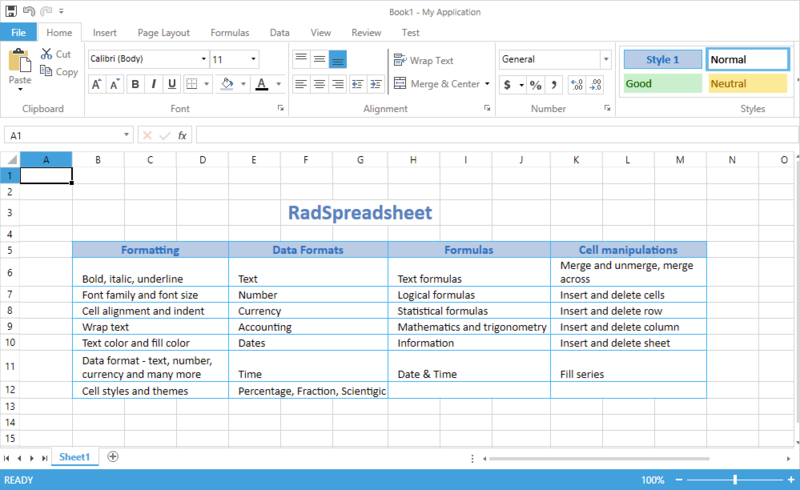 RadSpreadsheet comes with more than 200 built-in functions. The API enables you to easily plug custom ones as well. For more informations, refer to the Formulas section for SpreadProcessing. Shapes and Images: The UI enables you to work with images. API for insertion, positioning and deletion of images in worksheets. RadSpreadsheet enables you to show Charts and modify them as well: Charts. Auto fill and Series: Fill cells automatically with data following a specific pattern. Data Validation: Enables you to control the type of data or the values that users enter into a cell. Different data validation rules are available, including list, number, date, text length or custom rules. Copy/Paste: Add or copy worksheets within or across workbooks. Of course, copying and pasting of cells is supported as well. Named Ranges: You can use the named ranges on workbook and worksheet levels. Protection: Different options available for protecting the workbook and its worksheets from modifications. Printing: Many properties allowing you to customize the way the data will be printed. Some of them are automatic and custom scaling, headers and footers, page breaks, print area. Headers and Footers: The functionality enables you to add rich text content in the page margins when laying out a worksheet to pages. Scrolling: There are two scrolling modes - ItemBased and PixelBased. The first one ensures that the whole content of the top left cell is visible, the latter designed for smoother interaction. Integration with RadRibbonView. An easy to use Predefined UI. Localization: You can easily translate the string resources of RadSpreadsheet.